To understand, predict and ultimately control the behavior of our engineered microbial group effect, we have developed dynamic model of the system, based on transerential equations which describe and integrate the individual processes. This model involves several entities going from the molecular level (genes, RNAs, proteins, and metabolites) up to the cellular and population levels, distinct intracellular and extracellular compartments, and a wide range of biological and physical processes (transcription, translation, signalling, growth, transusion, etc). 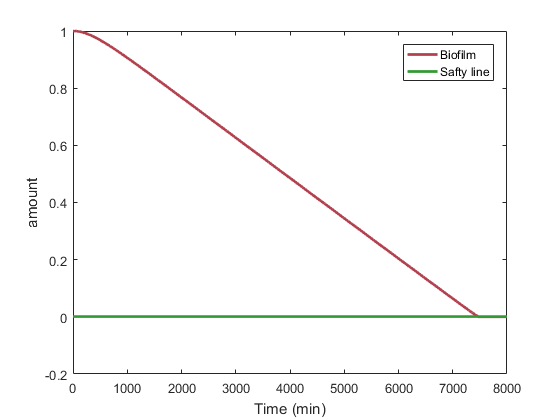 Here we can show the concentrate of DspB and Enterobactin produced by our engineered bacteria and the biofilm and rust removing time through calculating. Naturally, when there is a certain amount of HSL in the environment, HSL complex with afeR proteins and bind to afeR promoter which regulate positively the genes downstream (as shown on the Figure 1) and on that our sensing system relies to produce DspB and enterobactin. • We can determine the effect of afeR promoter and predict the production of DspB and enterobactin. • We can predict hao long our engineered bacteria would take to remove the biofilm and rust. 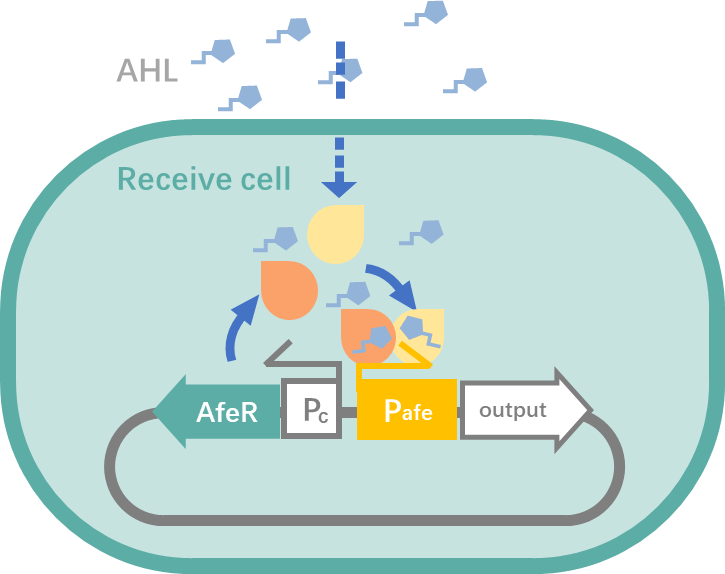 AfeR is produced by engineered E.coli and functions in cell and its concentration is obtained approximating the number of protein per cell, using the E.coli concentration (cell/L) and the Avogadro number. Assuming kinetics of AfeR-HSL complexation complexation is fast compared to the rest of the system, we assumed that the free and complexed forms are at equilibrum. The production of the DspB from the DspB gene includes transcription and translation after activation. In addition, we should also consider its transport and degradation. This process is modeled using a Michaelian formalism depending on its activator (AfeR-HSL complexation) concentration. The promoter strength is also taken into account. The DspB transcription depends on the transcription rate of the strain and the length of the DspB gene. The Avogadro number is used to express the transcription velocity in molar concentration in one cell per time unit. For the convenience of mathematical operation, we merged the ktranscript、RNA polymerase/gene and "V" intracell to a constant. The DspB translation depends on the translation rate of the strain, the mRNA length and the quantity of mRNA. The translation velocity is expressed in molar concentration in one cell per time unit. For the convenience of mathematical operation, we merge the ktranslation and Ribosomes/RNA and to a constant. Some of the DspB protein and mRNA are degraded. A degradation constant is used to model the degradation velocity. DspB protein needs to be transferred to the water environment to function. This process is taken into account through a passive transusion model. The biofilm is removed by the DspB and the process is modeled assuming a Michaelis-Menten kinetics. We treat enterobactin enzymes gene cluster as a whole gene (EntE gene). The production of the enterobactin enzymes from the EntE gene includes transcription and translation after activation. In addition, we should also consider its degradation. Because the enterobactin enzymes function in the cell, we don't need to consider its transport to the water environment. The EntE transcription depends on the transcription rate of the strain and the length of the EntE gene. The Avogadro number is used to express the transcription velocity in molar concentration in one cell per time unit. For the convenience of mathematical operation, we merged the ktranscript、RNA polymerase/gene and V intracell to a constant. The EntE translation depends on the translation rate of the strain, the mRNA length and the quantity of mRNA. The translation velocity is expressed in molar concentration in one cell per time unit. Some of the EntE protein and mRNA are degraded. A degradation constant is used to model the degradation velocity. 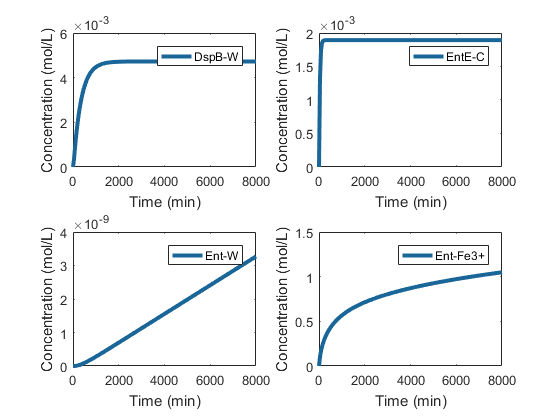 Enterobactin is produced by E.coli through the reaction catalyzed by EntE and is modeled assuming a Michaelis-Menten kinetics. Enterobactin needs to be transferred to the water environment to function. This process is taken into account through a passive transusion model. The rust is removed by the chelation of enterobactin. The system of ODEs was solved using Matlab R2016a. And we used the ode15s solver. You can freely re-use our code:General_resolution + System_of_ODEs. At the beginning of the project, we needed to know if our quorum sensing would work in practice and if the information transmission between the transerent modules was possible and sufficiently fast. We thus carried out simulations by solving the ODEs system to have a first estimation of the dynamics of our synthetic system. The initial conditions, such as the concentrations of E.coli and HSL were set to biologically plausible values. The variety of biofilm by modeling. 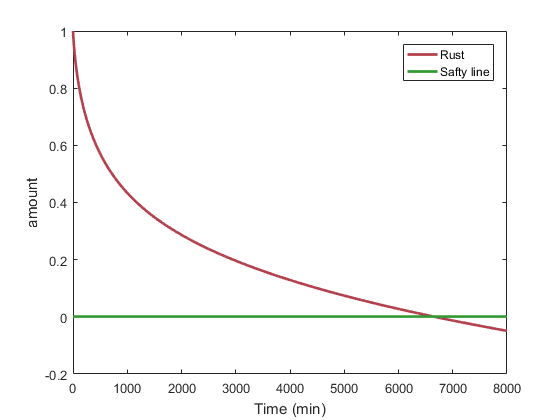 The variety of rust by modeling. The model result shows that usinng our engineered E.coli to remove a certain amount of biofilm needs about 5 days and to remove a certain amount of rust needs less than 4.5 days. The result is close to the real value which confirmes the feasibility of our project . The variety of DspB\EntE\Ent\Ent-Fe3+ by modeling. This visual representation of the system's dynamics also allowed us to check that each variable evolves in a realistic range of concentrations, hence indicating the model predicts a consistent behavior. 3. Li Y C, Zhu J R. Role of N-acyl homoserine lactone (HSL)-based quorum sensing (QS) in aerobic sludge granulation.[J]. Applied Microbiology & Biotechnology, 2014, 98(17):7623-7632. 4. Xiang Chen,Faming Zhu,Yunhe Cao,et al. Novel Expression Vector for Secretion of Cecropin AD in Bacillus subtilis with Enhanced Antimicrobial Activity[J]. Antimicrobial Agents and Chemotherapy,2009,53(9):3683-3689. 5. 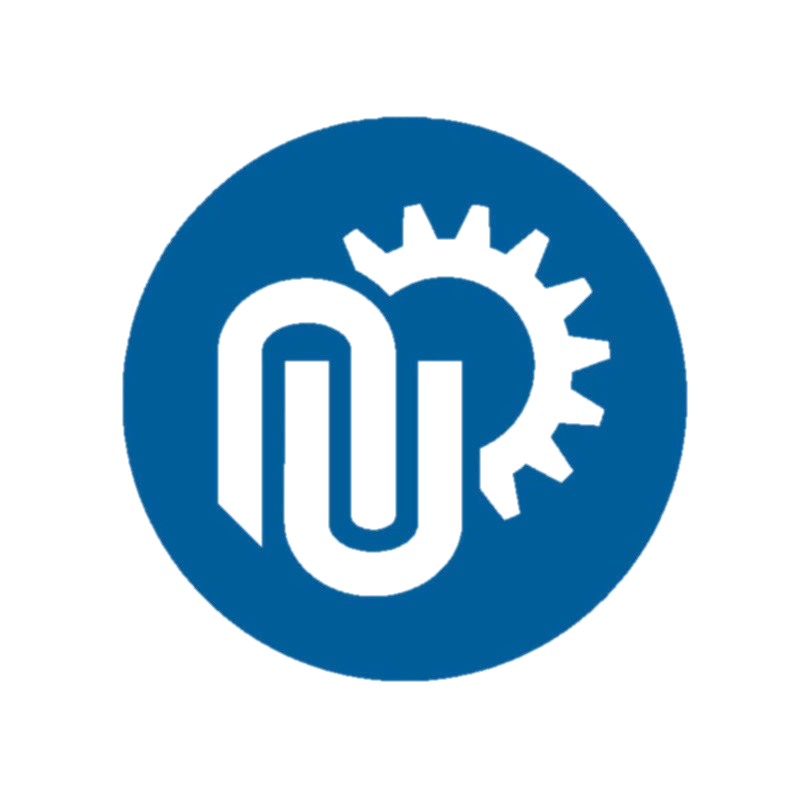 (Milo R, Jorgensen P, Moran U, Weber G, Springer M. BioNumbers—the database of key numbers in molecular and cell biology. Nucleic Acids Res. 2010;38(suppl 1):D750–D753. 6. Carrano CJ, KN R (1979) Ferric Ion Sequestering Agents. 2. Kinetics and Mechanism of Iron Removal from Transferrin by Enterobactin and Synthetic Tricatechols. J Am Chem Soc 101: 5401–5404.